← Weekly Meal Plan May 27-June 3, 2016 and LETTUCE! Let me start by apologizing that about all the dead air on the blog this past week. 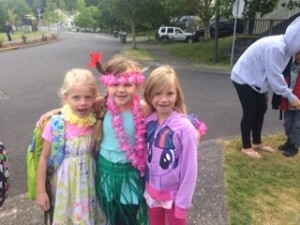 It’s been a rough one…one full of trips to the ER and tearful goodbyes to good friends. The weather here is getting nice, the North Oregon coast is getting out of the grips of the rainy season and moving into the gorgeous summer. Of course that means more time playing outside for my kiddos. While my kids and their friends were in the fenced back yard playing in the hammock, Brickman fell out and came in crying that he hit his head. Heads bleed A LOT! 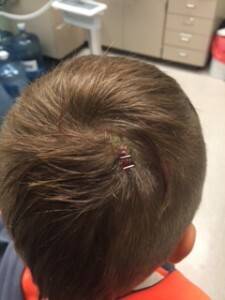 After husband and I looked at it, it was decided that a trip to the ER was needed, and it was…Brickman ended up with 2 staples in the back of his head. We were quick to make the decision to take him into the the ER and had the car out of the driveway before our the kids’ friends the Wisconsins’ went to get their dad who is in the medical field. He was on his way over to check it out as the var pulled away. It was nice to have that resource nearby, as I have used him more than once to tell my kids they were fine and not sick enough to stay home from school. But alas, their time with us is up and they must go to the next duty station in Wisconsin. Part of cooking for 13 is making copious amounts of food( which I love), and lots of dishes( that I hate). In the process of clearing up the mess, Baby ran into the kitchen and had a run in with a knife. 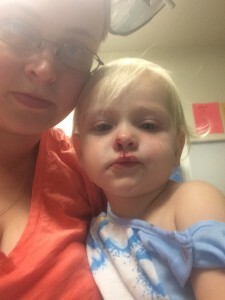 Her upper lip and nose were cut open and bleeding profusely…off to the ER for the second time in 5 days for stitches for one of my kids. Baby ended up being a stellar patient and was even laughing as her “kitty whiskers”, as I called the stitches, we being put in. The medicine they gave her helped for sure, but they said she was so laid back and such a good patient that a newer doctor practiced on her before the seasoned doctor finished up to make sure she has minimal scarring. The kids both go their sutures out on the same day and things were going back to normal. 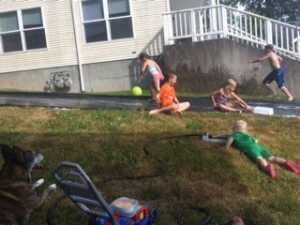 The weather turned hot today, so we decided to make a homemade slip n’ slide early…it was originally going to be put up for the neighborhood end of school block party. The kids had fun after lamenting that they missed the Wisconsins’, but some fun races down the slide with Mom and a BBQ dinner outside turned those frowns upside down…for a while. Brickman must be accident prone, as he bit into his lip pretty deep…yep insides of lips bleed a lot too!!! I know that lips heal fast and we don’t need to worry about scaring on the insides of the mouth, so we didn’t run off to the ER. We are keeping a watchful eye on his lip for now and he hasn’t complained too much and has been eating and drinking normally. So the silver lining…because of a shortage of smaller houses, we were offered the chance to move into the 4 bedroom house the Wisconsins’ lived in! We will be gaining more room inside and out and be giving our kids another connection to the memories they made with there friends. Plus, there is an AWESOME view of the water from the back deck! Thankfully, all the kids are healing up well too. Well, I must go make a list of what I need to start packing up and organizing for our upcoming move to 2 houses down. We just did this less than a year ago, so we must be crazy…but at least we are going through the purging process again. If I haven’t used it in the last year, it must go! This entry was posted in Coast Guard Life. Bookmark the permalink.